Results of a much-anticipated trial on fish oil and vitamin D generated conflicting headlines last weekend. The stories all covered the Vitamin D and Omega-3 Trial (VITAL) trial, which enrolled 25,871 healthy people 50 and older and randomized them to prescription omega-3 fish oil capsules, vitamin D supplements, both, or only placebos. They were followed for an average of 5.3 years. The statements seem clear: no benefit. So why did some news organizations proclaim otherwise? The answer may lie with a news release issued by Brigham and Women’s Hospital, where the trial was conducted. The release focused on a handful of secondary findings, which aren’t the primary questions researchers set out to answer. For example, researchers observed 28% fewer heart attacks among people taking fish oil. That rose to 40% in people who took fish oil but eat little fish. The perceived effect was highest in African-Americans, who saw a 77% reduction. Heart attacks were just one component of a composite “cardiovascular events” measure, which also included strokes and deaths from cardiovascular causes. Researchers often combine outcomes into a composite result to make it easier to show a statistically significant difference between a treatment group and controls, facilitating faster trials with fewer patients. See our primer on composite outcomes. Similarly, researchers also noticed fewer cancer deaths among people who took vitamin D for at least two years. As we’ve written, such secondary findings need to be reported cautiously. They do not have the same statistical authority as primary findings, and are more likely to be due to chance. It’s been stated that secondary findings should only be used to help interpret the primary result of a trial or to suggest avenues of further research. 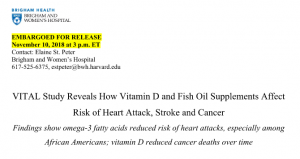 Yet the news release featured those rosy-sounding secondary findings at the top, with wording that made them sound like proven benefits: The subhead says omega-3 “reduced heart attacks” and that vitamin D “reduced cancer deaths” — similar to misleading causal language that appeared in some news stories. “Building false hopes is fundamentally cruel,” he said. The news release downplayed the primary findings, describing them on the third page and not flagging them as the main result. 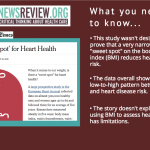 “You can talk about the secondary endpoints if you want, but not to the point where you obscure that the overall study was negative,” said cardiologist Christopher Labos, MD, one of our reviewers, who cited a “disconnect” between the news release and the study. Apparently, the study’s main finding was buried so deep that some journalists missed it. We asked Brigham and Women’s, which received about $40 million from the National Institutes of Health to run the trial, why its news release downplayed the main findings, elevated secondary findings, and didn’t explain the varying levels of evidence. Lead researcher JoAnn Manson, MD, the hospital’s chief of preventive medicine, noted the secondary endpoints had been planned before the trial was conducted and were contained in the published research. “We don’t think this information should be withheld from the public,” Manson said in an email. Note that no one has said anything about withholding those secondary findings. We’re talking about providing adequate explanations and context. Some news organizations that led with the primary result also reported the secondary findings, but wisely included caveats. Such context was missing in the stories from Reuters, The Post and HealthDay. Besides appearing to rely heavily on the news release, those news outlets didn’t include much input from independent sources. HealthDay used one who hyped the secondary finding on heart attacks as “profound.” Reuters and The Post didn’t have any. The Post and HealthDay further confused things in the way they covered a different trial called REDUCE-IT in the same story. REDUCE-IT showed a benefit for a specific population of people with heart disease who took a fish-oil-derived drug called Vascepa (icosapent ethyl). 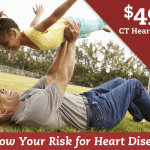 Both VITAL and REDUCE-IT involve fish oil, were presented on the same day at an American Heart Association meeting, were conducted at Brigham and Women’s, and were published simultaneously in the New England Journal of Medicine. We’ve often noted that negative or null results have difficulty attracting news coverage. The sweeping coverage of VITAL shows it can be otherwise. Its results challenge common beliefs, which is the essence of a good news story. Yet Brigham and Women’s shrouded those taxpayer-funded insights with dubious positive-sounding observational results, and some news organizations were hooked into going along. 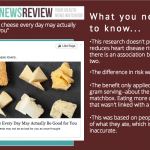 Martha Gulati, MD, chief of cardiology at the University of Arizona, agreed the findings “didn’t need to be spun,” and will help people make more informed choices. “As a health consumer myself, I wouldn’t want to be spending my hard-earned money on something that doesn’t give a benefit,” she said. Incredible that a 2nd level article, one that’s writing about other articles, did nothing but skip to the end to see what the people who wrote it had to say. Then the MD saying she wouldn’t waste her hard-earned money. Are you kidding me? The current institutional establishment is chewing through 20% of the GNP! Makes defense look like a bargain. And most of the money is palliative (in 2012, the US spent $245B on Diabetes, curing zero people). Sadly, what this article shows is journalism is completely dead. The study found that D reduced cancer risk for people with BMI < 25. We have known for a decade that D dosing must be based on BMI, guess why. Because D is a fat soluble vitamin. Now hard was that as an explanation? Its astounding how many paid, professionals, do not even read the studies, just run to the conclusion and then go scream it to others. Part of the reason the biggest guy in health is Michael Greger. Go watch a few of his videos. The articles say that fish oil and D supplements are a waste of money, but be sure to eat fish, and get some sun. Such hipocrisy. I can think of a lot ways that I am already wasting my money, than supplements that might improve my health, even a little bit. But, eat Mediterranean. I hate vegetables. The Okinawans have the longest lives, and they eat mostly rice. If you read the article, the benefits of taking fish oil are tremendous, and so is taking vitamin D. A 28 % reduction in heart attacks, and the article brushes this off almost as if it were insignificant. This smells fishy, no pun intended, to me get people to believe that prescription drugs are the needed remedy. In bed with the FDA no doubt. Ya, with the list of side effects, I’ll stick with supplements. Thanks for your feedback, John. As the post explains, the observed reduction in heart attacks was a secondary finding that must be interpreted cautiously. 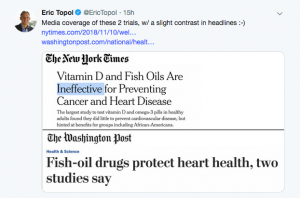 We think it’s important to inform the public about the lower level of evidence involved in that finding, and why it’s subordinate to main finding that fish oil offers no heart benefit. Your suggestions that our not-for-profit web site is trying “get people to believe that prescription drugs are the needed remedy” and is “in bed with the FDA” are laughable. Please peruse our numerous critical reviews of incautious news stories and news releases on prescription drugs, as well as our strict and transparent funding policy. Shouldn’t accurate reporting also avoid declaring “No Significant Benefits” and “I wouldn’t waste my money” when only one health benefit out of a dozen or more distinct possible benefits was shown to be lacking? The linked article doesn’t prove anything, but it does list many areas of needed research before we can safely declare “no benefit”. It is also not an exhaustive list, i.e. It doesn’t mention possible benefits to pregnant and nursing mothers and early development in children (children who notoriously refuse to eat oily fish). Isn’t reporting “no benefits” in this case like reporting that all of our oceans are empty because scientists have found conclusive evidence that seawater is deadly to trout and walleye? Thanks for commenting, Brian. 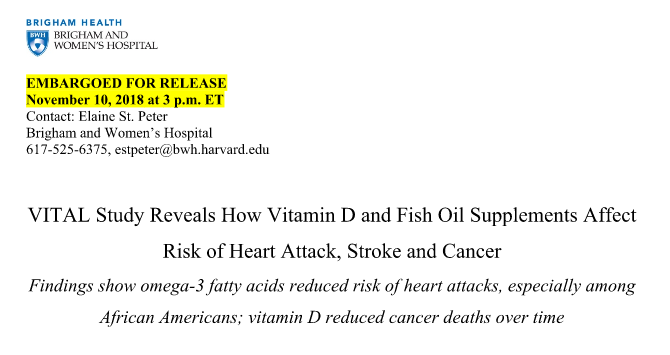 Accurate reporting would say that this large and reportedly well-designed trial found no protective benefit for vitamin D and fish oil when it comes to heart problems and cancer. 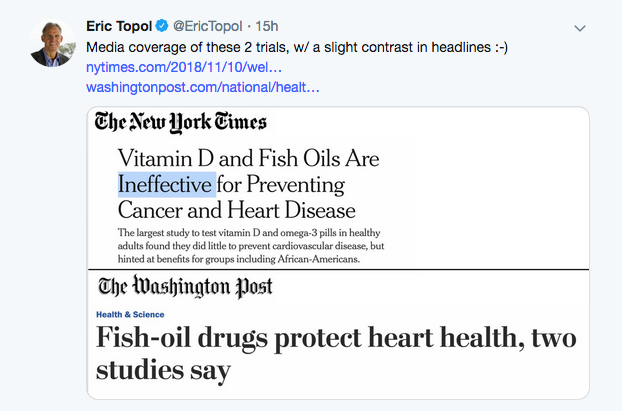 Of course, we can’t rule out that there’s no benefit from fish oil for anyone under any circumstance, but no news organization has reported that to my knowledge. Regarding your Healthline link, it’s notable most of the purported “benefits” in the piece say fish oil “may” do this or that. Meaning of course, it also may NOT. The article makes an interesting and valid point, but still oversimpliflies the issue. The study itself has problems that affect definitive outcomes. For example, about 50 percent of the participants were on blood pressure meds and and 37 to 38 percent took statins (anti-inflammatories, which is also the omega 3 benefit of fish oil). In a study about fish oil for primary prevention of heart disease, these factors should be explored more when analyzing data. Also the study was geographically diverse, but no one looked at the percentage of participants who live in warm, sunny climates like Florida, the southwest, and soCal, who would get vitamin d benefits from the sun. Another issue is that only 65 percent of participants permitted blood testing so there was no way of provING compliance or if blood levels were at therapeutic levels to start with or after the study for over a third of the participants. To take this study seriously, which as taxpayers we should because we funded, we need reporting that examines the details that matter. Thank you very much for explaining this very problematic matter. It so troubling how popular and highly regarded news outlets have published such misleading information about the study. 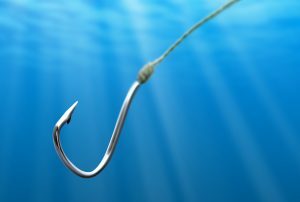 It could be a matter of life and death for many people, and it certainly is for the countless fishes who are exploited for the oil and the environmental destruction that fishing/fish farming entails.